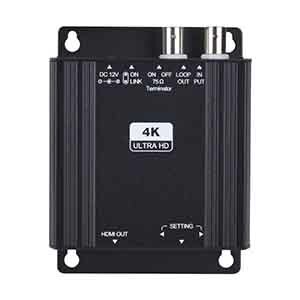 Converts HD-TVI/HD-CVI/AHD signal to HDMI signal. BNC input supports: 1080p/4MP /5MP up to 4K (8 MP). Supports both up and down scaling function. HD Loop Out support video & data control (Up The Coax). Built-in OSD for easy operation.